Some of the most morally corrupt actions taken by those we were taught to trust. Denis Ryan is but one only of those these religiously corrupt police collectively stood in the way of human rights, democracy, and the expectation of justice. The reality of these abuses is such that a million live will have been plunged into torment by fools believing their actions were driven by a god. The production of pain and suffering from these crimes by police going back to the 1940s and further still bring suffering to families and individuals and rarely will one of them be acknowledged and rarely will an exceptional one be compensated. The unnecessary suffering caused by this abuse of trust is passed over with lame comments from police even today that those were different times. Those were the times that decent men were deceived into terrible deeds as a result of their indoctrination into religious cult. 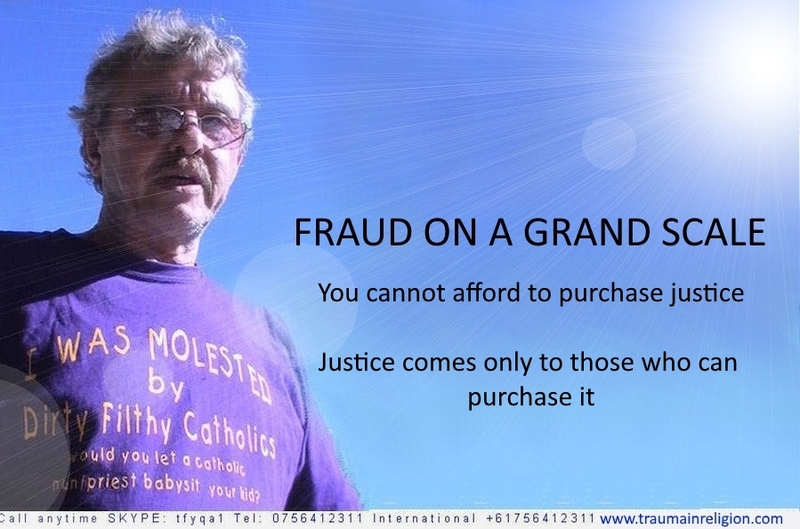 Not until that truth becomes known to the entire population will justice come posthumously for millions while today we still have catholic police men and women in positions of authority within policing across the country responsible for investigating the crimes of catholic clergy and there is silence from government and police commissioners on this issue. What an abysmal history will be written - raped by clergy, abused by government and policing authorities, branded and blamed by multiple health systems, abandoned and denied by education and all you want to do is to be helpful and to help to protect children. You were lured with promises of support before during and after but you did not disclose that there were religious belief conditions on that support and on the efficacy of the services those providers can give. A justice system so constipated and guaranteed to fail the victims of clergy abuse as a result of its Judaeo Christian heritage and the connections of its clergy into every nook and cranny of our political, health and education systems. The demand for evidence from our legal and political system fizzles into mist the moment the question of does god such as the Christian god exist is posed. Instead we get to live in a world that has answered the unanswerable with a yes and million upon million of people will suffer as their right to abuse and to bully and to intimidate and to obstruct justice is protected under the assumed right to practice a religion and what did we get - hundreds of thousands of raped children. Police in every jurisdiction acted in similar ways - notice how little action has been taken.